Go through the posts on this website and you will find several references of Temple’s offense being one where the coaches tried to fit a square peg into a round hole. So you can excuse us for wondering just where Temple head football coach got this notion from when he uttered this quote at the inaugural Bad Boy Mowers Gasparilla Bowl press conference. Collins could have saved a whole lot of time and heartache by reading what was posted here in September. “Ask any Temple fan who followed the team over the last 40 years (I will raise my hand here) who the best set of receivers are in Temple history and that fan will probably say the current group of Ventell Bryant, Adonis Jennings, Keith Kirkwood and Isaiah Wright. Any offense that has those four guys on it is not rebuilding, it should be reloading. Better late than never, but putting the square pegs into the square holes and the round ones should have been something that was figured out by August, not by the end of October. The real sad thing is that Collins seemed to be onto it at the season ticket holder party when one season-ticket holder asked him to “never take Nick Sharga out of the game” and Collins responded by saying that he would not and, if anything, Sharga’s role as a lead-blocker in a play-action-oriented offense would be greater than it was a year ago. For reasons only Collins knows, he lied. Maybe he allowed offensive coordinator Dave Patenaude to have too much input. At least Collins dictated a heavy dose of play action over the final six games of the year and that saved their season. That was the personnel they had all along. The Owls took way too long to figure out that they never needed a “running” quarterback as much as they needed a guy with a big enough arm to get the ball to their most talented players on offense, their wide receivers. They figured out too late that many of the “drops” they suffered in September were the result of these same receivers circling back on poorly thrown balls. When they inserted the guy with the big arm, those receivers caught balls in stride and away they went, usually into the end zone. Collins followed the outline of the advice, although we would have liked to seen more running from guys like Ryquell Armstead and David Hood behind a guy like Nick Sharga. Maybe next year with those two behind a guy who goes by the nickname of Nitro, opening passing lanes for a guy who goes by the name Juice. Let’s hope a second-year coach isn’t as slow on the uptake as the first-year one was. One of the fastest ways to fix a problem is to recognize it and, with that one quote, Collins showed there is hope for a better future plan. This entry was posted in Geoff Collins, Temple football, Uncategorized and tagged Geoff Collins, Nick Sharga, Temple football. Bookmark the permalink. interesting read below, remember the early BP excitement? I don’t think any of those guys will finish in the final five. Milton, though, is the best of the lot by a good bit. Can you start talking about Temple basketball because Fran Dunphy needs to go! Please don’t talk hoops, Mike. This is our one sanctuary away from that train wreck. Let someone start a “Temple Basketball Forever” and talk about it there. Mike. You are way too modest. It was you and I who told him not to take Sharga off the field. Now that we know he lied, I will never give him the benefit of the doubt. (Unless of course, he wins enough to go to a P-5 bowl-LOL). Amazing admission, though, about not knowing the personnel well-enough. Could have saved him a lot of time to go back and read what we wrote on 9/22/17. By the way. I think Sharga has grounds to sue for coaching malpractice. Even after Sharga showed during the Army game that he was a hell of a defensive player, he didn’t play D again. What a waste of a senior year. I still say that if the OC isn’t fired, we are in for many Bobby Wallace type years. One step at a time…..hoping for changes for next year is fine, but it can and should start in one week in the bowl game. Right now that’s what we should be hoping for. Bowl win, winning record, jump start on recruiting and refining those changes he started making, even if too late for this season; and using Sharga throughout the game, damnit, so he can end his Temple career on a high note as he deserves. Hey John, I was typing when your last comment came in. Comparing this season to Bobby Wallace is a bit exaggerated don’t you think? He was the worst Temple coach ever and literally almost ruined Temple football. CC’s first season is already better than that. I do not believe that I’m exaggerating because Collins has shown nothing to believe that things are not going to get worse. He won six only because he was handed a talent laden team like Jerry Berndt was and thus, was almost guaranteed to win some games. Despite that, he almost pooped the bed against bad Nova and UMass teams and did so against Army and UConn. If he doesn’t win six next year, it’s B Wallace time all over again. . I don’t believe you are exaggerating. When I went to the season ticket holder party, on the way there I was thinking what would be the one thing I wanted to say to Collins if I met him and it was to maximize the use of Sharga. I got to say my piece and I was pleased with his answer. I did not think he was bullshitting me because he had a close relationship with Nick as his “fullback coach” as well as HC. I do think, though, he allowed Patenaude too much rope on the offense until the last six games of the season when it seemed that he dictated at least a small shift in philosophy. As far as Nick, I kept hoping the last 4-5 games they’d use him like Rhule did and that never materialized. I don’t expect miracles in the bowl game but I like to see him lead the way for a 200-yard effort by Ryquell. You saw what happened at Tulsa when Rock didn’t have Nick in front of him. Rock found no hole and had to completely recircle the field to score a touchdown. It should not be that hard for the brain trust to figure this out. I am not a fan of Collins but forget about offense philosophy for a second, it was bad game day coaching in the Army and UConn. games that cost this team 2 wins, this team should have been 8-4. It is unfortunate but Temple has two mediocre coaches in their major men’s sports programs, Collins and Dunphy. This falls squarely on the AD who gave us Collins and extended Dunphy’s contract through 2021. It’s going to be a rough couple of years for Temple fans. I hope I’m wrong. Amazing that Rhule basically admitted that he didn’t have success until he stopped dicking around with the Satterfield spread and adopted a power running identity (which also helps the defense) and, now, Collins said he didn’t find out until late that his personnel was suited for basically the same attack. Those of us who followed this blog for the first two years of Rhule know Mike was the one begging for Rhule to go fullback and play-action and Rhule did not win until he took that advice. Very naïve to believe Rhule didn’t read this blog. Maybe Collins snuck a peak, too. Dunphy has forgotten that his role as a coach is to get his team ready to play. Instead of the tough taskmaster, any D-1 coach has to be at times, he has turned into a grandfatherly type too quick to excuse his team’s many faults, including lackluster defense, no boxing out, no real hustle, and no understanding of how to run an offense. I heard through the grapevine that he’s too easy on the players during practices. The losses to LaSalle and GW prove this because a well-coached team would not have blown an 11 point lead late in the LaSalle game or fallen behind by 15 to a mediocre GW team. And during the Nova game, a well-coached team would not have opened so poorly in its biggest game to date. If Dunphy were Chaney tough, Obi would be inside battling for rebounds on the offensive end instead of flitting around the three-point line like a prima donna. Not only does that waste a 6’10” player, it also puts TU at a disadvantage on D because he’s not quick enough or fast enough to stop a break. Collins’ many faults have been outlined here many times. Next season will tell if they are fatal or just the result of growing pains. I don’t have much hope because he didn’t change all that much this season (clock management and play calling for example) and kept one of his best all-around players in Sharga more off the field than on it. So sad for guys like Jacob Martin, Sharif Finch, the entire defensive secondary, the fullback, and two great wide receivers who never were given the opportunity to win the nine games they should have won due to extremely dumb game-planning. As far as hoops, this squad could use a few goons. Much too nice a group of players. Obi getting 3 points and shooting 1-for-4 from the line would be puzzling if it weren’t for the obvious fact that he only cares for two or three minutes at a time and coasts for the other 37 minutes. Brunson, on the other hand, is a paid assassin. I get your points John. I just don’t see CC dipping to Wallace’s 1 and 2 win seasons (zero his last year), that’s all. Yeah, this season should have been 8, maybe 9, wins but for a first year HC he did much better than Wallace did as a HC coming in. Maybe I’m wrong but I seem to think Collins got better as the season progressed, so i’m hoping (not at all expecting) to see some improvement with the coaching – I guess you don’t see him improving as Rhule did. If he doesn’t get with it the good times are over. The final recruiting take will show a lot too. Anyway, happy holidays to everyone – especially if there’s a bowl win! The BB team is soft. Is it from coaching? Or maybe they’re just not tough enough as athletes to begin with, recruiting? Obi being a prime example – I just don’t see him as an NBA prospect everyone talks about, including his erratic shooting (he’s tall and has a nice touch but inconsistent) like in the Nova game where he should have starred. Dunphy insists on playing Aflakpui (a competent but not great player) instead of the other tougher big guy Moore who comes off the bench and really contributes – he should start or at least get more minutes. So, it’s either “Mr. nice guy” or get tougher – coaches and players alike. Got to wonder if Brunson had come to Temple would he be the player he is now with Nova? Guys, I don’t get the Bobby Wallace bashing as the ‘ worst ever’. He always had a few interesting players that made dome great plays. I think the key to failure was the Big East back then had some great teams, Geeze I miss those matchups against top 20 teams. We saw many great players back then. temple FB was still stuck with the image of a city team with goons and punks. This image was in place before Wallace. The problem of playing in Franklin Field all those years also contributed to a poor image. We finally got an interesting QB and then the Big East cut us out , which was the final step, because QB Washington was a most intriguing QB back then, who went early and we had some hope of 7 wins, as we had close games vs great teams. As a fan I am not anti Wallace, he had no support. Bobby was horrible. One season, he changed the offense three times, He also installed a read option offense with Mike McGann, a pro set qb if there was ever one, he could not recruit, he took Tarnado Sharps, the Big East leading rusher the previous season, out of the offense, and he was 19-71, Tell me again how good Bobby Wallace was? Wallace was, as Charles Barkley, would say, turrrrible. He should not be the reason, though, the Owls fail to hire a proven head coach from, say, the FCS level because FCS and Division II are two different worlds. 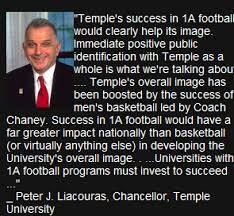 FCS teams play and often beat FBS teams and that’s the level Temple is at. To me, the benefit of Temple hiring a great FCS coach is that he doesn’t use Temple’s time to train for a P5 job. A head coach, as opposed to being an assistant, knows how to be a head coach. Look at Collins. It took him a half year to figure out his personnel. A HC would identify that from last year’s film. Collins cost Temple two wins and a shot at a nine-win season. Six wins with this talent is stealing money and that’s what Wallace did for 8 years here. Ok then, I don’t think he was the worst ever, that’s all. On the other hand, I wonder if there was a more explosive player than T Sharps. Those couple of times when he raced down the field on 40-60 yard passes were some of the best ever. I wonder why they didn’t do it always every game…. One more thing. Wallace had success at D-2 because he had a wealth of D-1 transfers likedid K.C Keeler did at Rowan. He was not winning with D-2 kids. Wallace lost my support when he lost to William and Mary at the Vet. As bad as and maybe worse than Rhule’s loss to Fordham. Gee I didn’t remember Wallace won so many (19) games. I do remember how the win numbers went down to 1-2 and zero wins per season. The biggest problem was that Temple kept him for at least 3 seasons too long. Sorry oh-well, but to me Wallace’s tenure was the worst ever – I’m a ’68 graduate when Makris was coach and football was decent so I’ve seen a lot of bad football to in between compare to. The Owls running game was not strong enough for a downhill run play action offense. Three big, strong pegs were brittle this year. It will be interesting to see the 2018 recruiting class.